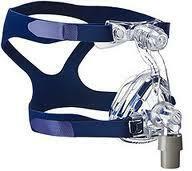 The latest nasal mask from ResMed is the only mask with ActiveCell Technology. Its unique cushion features an ‘active cell’ that expands and contracts to suit user movements and therapy pressure changes throughout the night. Sizes Small, Medium, Large and Large Wide.